For many household use, it is common to see just a modem and a router. That’s enough for most family network requirements. However, if you have too many computers to manage, an Ethernet switch is definitely what you need. Since network switch is not prevalent in ordinary homes, many people don’t have a clear understanding of it, let alone its usage. Here we will figure out what is an Ethernet switch used for and how to use and Ethernet switch. An Ethernet switch is a network device used to connect different PCs, servers, laptops or other Ethernet devices to a local area network. In this way, the connected devices can communicate with each other. The switch utilizes an MAC access table to exchange data packets among these devices. Network switches come in many types. Different switches have different applications and functions. They may come in 16, 32 or 64 ports, and also in various port speeds. The basic speed is 10 megabit per second, then 100 megabit. And today we also have faster gigabit Ethernet switch which realizes 1000 megabits per second. Switches that contain more ports or higher speeds are suitable for more demanding conditions. What Is an Ethernet Switch Used for? The Ethernet switch plays an integral role in most modern Ethernet local area networks (LANs). Here introduces two switch types for different utilities. The one is the fool-proof unmanaged Ethernet switch and the other is the intelligent managed switch. Unmanaged switches simply allow Ethernet devices to communicate with one another by providing a connection to the network. Unmanaged switches are truly plug and play devices. However, this simplicity of unmanaged Ethernet switches also limits the functionality of a network. Therefore, unmanaged switches are usually used for small size environments like home where the applications are relatively few and simplified. Managed switch is more advanced than unmanaged switch as it not only possesses what the latter features with, but also can be configured and properly managed to offer a more tailored experience. Most managed switches are 10gbe Ethernet switch, 40gbe, 100gbe or much faster switches. Those can be deployed in large data center, server rooms and so on. Whether it is the unmanaged switch or managed switch, the usage remains essentially the same. It should initially access the network and the power supply. This part introduces using an Ethernet switch. First, connect modem to Ethernet input line. Modem is the device that brings the signal into the network. Second, connect router to modem. Router translates the private network address into public address so as to entitle all the connected network devices to the Internet. 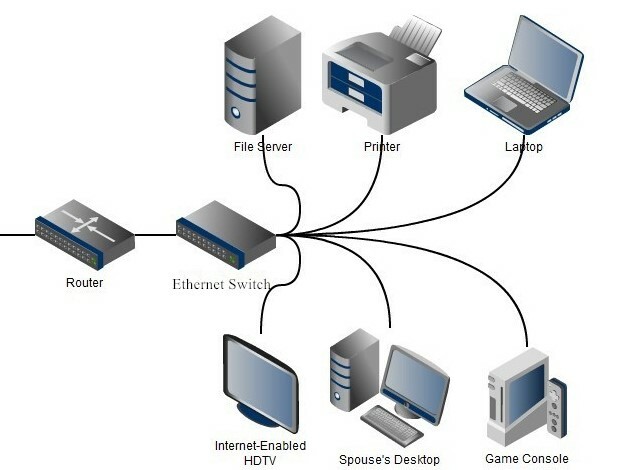 Third, connect an Ethernet cable to one port on the switch, then connect the other end to a wired device such as a computer. Repeat this step to connect all PCs, servers, laptops or other Ethernet devices. Fourth, connect an Ethernet cable to one of the ports at the back of the switch, then connect the other end of the cable to one of the Ethernet ports at the back of the router. The switch is thus becoming the extension of the router. You plug in one output to your router, and the other ones will just split up that connection to give you more hookups. Fifth, connect the supplied power adapter to the power port on the switch, then connect the other end into a power socket. This step can be omitted if it is a PoE switch. Having finished the connection, the unmanaged switch is ready to go while the managed switch may require further adjustments through a supported method, whether it is a command line interface (accessed via secure shell, etc. ), a web interface loaded in your web browser or Simple Network Management Protocol (SNMP) for remote access. This approach will unleash various options, including port speed, virtual LANs, redundancy, port mirroring, and Quality of Service (QoS) for traffic prioritization. This article introduces Ethernet switch and illustrates how to use an it. Ethernet switch is basically regarded as the port extension of the router, and also grows with more functions as the network expands. As for the issue—how to use an Ethernet switch with router, please read the post “Network Switch Before or After Router”. What Is the Best Way to Connect Multiple Ethernet Switch? In the big data era, gigabit Ethernet switch with high capacity has gradually penetrated from big enterprises, SMB to small offices and homes. Newly emerged technology like WIFI is also driving the proliferation of wireless APs and other applications. Therefore the Ethernet topology requires for a comprehensive integration of various devices like firewall, servers, routers and multiple Ethernet switches. How to connect multiple managed switches together? Can I simply connect network switch one by one? Does daisy-chaining switch make sense? 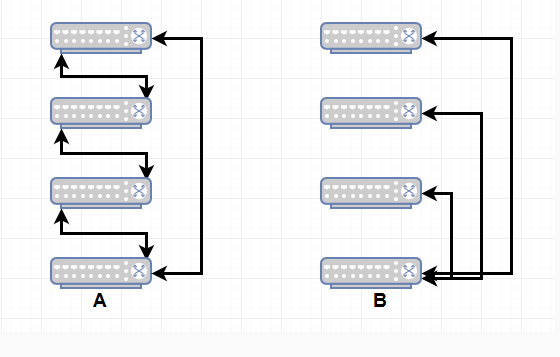 Or should I stack switch with stackable switch to set up a switch stack? What’s the best method to connect several data switches together? Switch cascade is a traditional way to connect multiple Ethernet switches, which comes with various methods and network topology under different requirements. Among them daisy chain topology and star topology are two common ways. Daisy chain is a layout form to connect multiple Ethernet switches together in sequence or in a ring. A simple linear topology displays as A-B-C, in which you just daisy chain each network switch top to bottom. For no more than 3 Ethernet switches, a linear topology of daisy chaining is okay since there is no loop. However, it owns drawbacks in switch failure due to lacking redundancy. Once one network switch fails, the others will also be dragged in. A simple ring topology is A-B-C-A, which can provide redundancy in link failure. However, simultaneously a loop creates when you finally daisy chain switch C back to A. Thus even only daisy chaining 3 Ethernet switches, an inevitable loop can be a fatal weakness. Simply put, daisy chaining switch is error-proof and easily causes unnecessary low performance issues. Besides loop, a bottleneck creates in the chain and speed will slow down when traffic passing through the second Ethernet switch (since the link is heavily utilized). So daisy chaining switch is not recommended if scheme is optional. For simple home use or low demand networks, daisy chaining switches can make sense. But make sure your network switch support STP to deal with the loop issue. Figure 1: An illustration of daisy chain topology vs star topology for connecting multiple Ethernet switches. Compared to daisy chain topology, a physical star topology by deploying a powerful core switch to connect multiple access switches with uplinks is an optimal solution. For instance, connecting each gigabit switch via 10G SFP+ uplink to a central 10GbE switch. Or connecting a powerful gigabit Ethernet switch to each edge switches. In this scenario no loop occurs and all access switch is much closer to the central switch data center. For redundancy concern, you can also double or triple uplink each access switch to the core switch. Figure 2: Deploying a powerful gigabit Ethernet switch S3800-24T4S as core switch to connect edge switches, which forms a simple star topology. Daisy chaining switch can be a solution when Ethernet switch quantity is small and separate placement is required in low demanding applications. How about an optimized way to connect multiple switches? Here comes stackable switch. 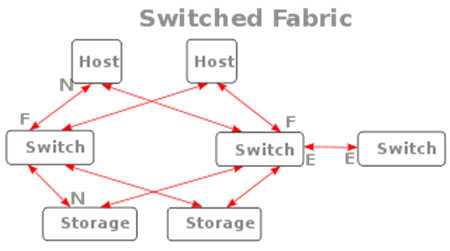 Stackable switch deploys advanced stacking technology to achieve switch stacking, leaving out performance issues of clumsy daisy chaining topology like loops and bottlenecks. To stack switch with managed stackable Ethernet switch can set up a switch stack, which works as a unified system with one console port for control to enhance network scalability and simplify network management. 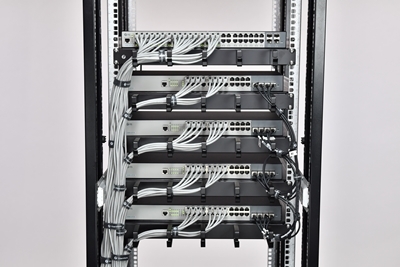 The port density and performance of switch stack can equal to expensive rack mount switch. Say stackable 24 port gigabit managed switch with 4 10Gb SFP+ uplinks: S3800-24T4S 1000Base-T copper switch and S3800-24F4S SFP switch. Both Ethernet switch supports up to 4 24 port switches stacked together, providing 96 1GbE port density and switching a total capacity of up to 512 Gbps. Also with single and dual power supply available, this 24 port gigabit managed switch offers redundancy in emergent power outage. To stack up S3800-24T4S 24 port switches with 10G SFP+ ports, you should connect them via SFP+ modules with fiber patch cable or via DAC or AOC directly. Figure 3: Deploying S3800-24T4S stackable 24 port gigabit switch to stack switch. To cascade network switch by daisy chaining topology or star topology is a simple way to connect multiple network switch. Daisy chaining switch is not recommended due to aforesaid performance issues like loop and bottleneck. However, it does make sense when a powerful core switch is absent. Otherwise to connect gigabit Ethernet switch with 10G uplink to a core 10GbE switch is a better solution to go. Using stackable switch to stack switch leaves out loop and other link issues. However, it only be feasible among same stackable switch model or stackable switch from the same vendor. Also, all Ethernet switches shall be stacked together, so it doesn’t support separate placement. Table below compares the pros and cons for connecting multiple network switches by daisy chaining switch and stacking switch. You can refer to your own demand for selecting the best way. Traditional cascading Ethernet switch (daisy-chain topology or star topology) and advanced stacking switch are two ways for connecting multiple network switches. When both stackable switch and a powerful core switch is unavailable, problem-prone daisy chaining switch makes sense for low demanding applications. Otherwise you can deploy a 10GbE switch or powerful gigabit switch as core to connect each edge switch for better performance. Stack switch by stackable managed switch, deploying stacking technology as built-in software to connect multiple Ethernet switch is a must for enterprise-level networks. It leaves out low loop issues and simplifies control mechanism. With the booming high speed broadband technology, modern Ethernet switch has stretched its branches to SMB operators and even home individuals. The exclusive property of network switch to big enterprises no longer exists. Accordingly questions about the uplink ports on Ethernet switch has put forward by lots of newbies. What is uplink on Ethernet switch? What is the function of 10Gb uplink on gigabit switch? For a specific home or SMB usage, should I employ network switch with 10Gb uplink or 1Gb uplink? With concerns of a reliable backbone, should I upgrade to gigabit access switch with 10G uplink to core 10GbE switch? For anyone with doubts about Ethernet switch with 10Gb uplink vs 1Gb uplink, this article may help. 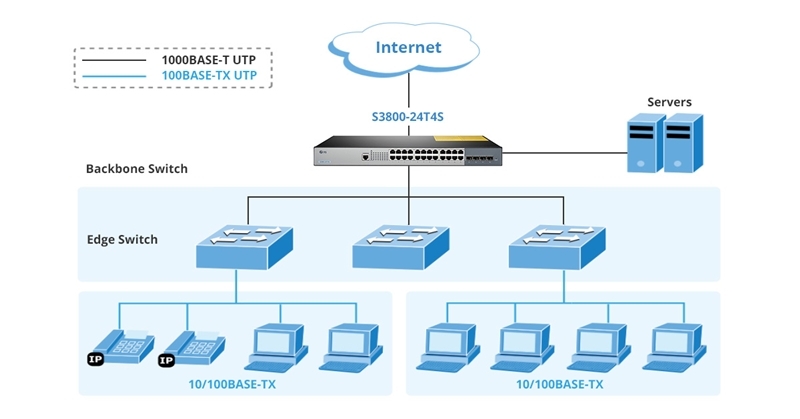 Uplink port on Ethernet switch serves as different layer network connection, which enables a lower network to link up to a higher network. One also uses it as regular port to connect end users while link aggregation is not involved. Connecting the uplink port on one access Ethernet switch to the regular port on another higher-layer core switch enables bandwidth expansion. The uplink bandwidth will be shared by all the end devices connected to the access switch regular ports. For example, by putting a 10Gb uplink on a 1Gb Ethernet switch, it would let 10 devices on the switch communicate at 1Gb each at the same time with the rest of the network. Otherwise if the uplink was only 1Gb, those 10 devices would only be able to get about 100Mb each. 10Gb uplink is commonly built in 1Gb access Ethernet switch for 10G link aggregation. Thus gigabit switch with 10Gb uplink is also called as 10GbE switch by many users. In the market such Ethernet switches with 10Gb uplinks are available for copper and optical SFP switch with 2/4 uplinks. For instance, FS provides 4 SFP+ 10Gb uplinks on 24/48-port 1000Base-T RJ45/SFP managed gigabit switches such as S3800 series 24-port stackable 1000Base-T/SFP Ethernet switches. Some vendors like FS.COM also bring in PoE to 10Gb uplink switch for advanced features. Say S1600-48T4S 48-port PoE+ managed gigabit switch. It can boost your network to a switching capacity of 180Gbps and offers 600W total power budget for power-hungry PDs. Such Ethernet switches with 10Gb uplinks frequently used as access layer switches to link up to backbone core 10GbE switch. Then all end users on the gigabit switch can share the 10Gb bandwidth, not 1Gb anymore. Figure 1: Deploying FS 48-port Ethernet switches with 4 SFP+ 10Gb uplinks ports as access switches to connect 10Gb core switch in data center layer. Only a few years ago 100Mb Ethernet switch are still common among many SMBs as access switch. However, nowadays it has gradually obsoleted by 100/1000MBase gigabit switch. To enhance network connection resiliency, modern gigabit switch comes with 24/48 RJ45 100/1000Base-T ports and 4 1Gb SFP ports for uplink. Except uplink function, The SFP uplinks on copper gigabit Ethernet switch provides optical link option when the network requires fiber cabling. FS supplies such SFP uplinks on 8/24- port PoE+ managed gigabit switch with different power budget for 1G speed. 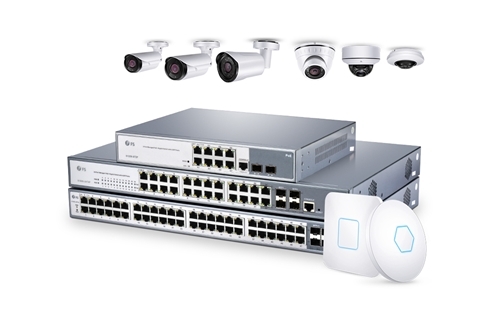 Figure 2: FS PoE+ Ethernet switches with SFP 1Gb uplinks and PoE+ switch with SFP+ 10Gb uplinks are natural fit for IP cameras, VoIP phones and wireless APs. So how to choose from 10Gb and 1Gb uplink of Ethernet switch? Try to ask yourself about questions as follows. What kind of application virtualization are you implementing? How many users are there? Whether the applications and user quantity requiring for the extra bandwidth of 10Gbps? Is my cabling up-to-snuff for 10Gb uplink? Can I afford 10Gb Ethernet? Then here are some suggestions for you. First, attach importance to applications virtualization. If your employees only need to open occasional Word documents, reply to emails or update database records, there would not be much of a requirement for 10G uplink on Ethernet switch. But if you should do lots of mass data transfer such as photos and videos exchange even in a small advertising shop it would quite be another story. Second, concern about number of users. The proliferating wireless APs and office devices bring much burdens to your network. Third, for concerns of future-proof expansion and a reliable backbone, even if your current 1GbE is unsaturated, Ethernet switch with 10Gb uplinks is also a good solution for enterprises with hardware upgrading demands. But if the aforesaid factors not concerned, your gigabit Ethernet switch with 1Gb uplink may suit your network just fine. Both 10Gb uplink and 1Gb uplink on Ethernet switch are designed for link aggregation of multi-layer switch connection. Ethernet gigabit switch with 10Gb uplink enables total 10Gbps bandwidth to divide to end devices for accessing max. 1G speed. While Ethernet switch with 1Gb uplink delivers max. 100Mbps data rate to 10 devices. For concerns of high bandwidth applications, multiple office devices quantity and future-proof expansion, Ethernet switch with 10Gb uplink is the way to go. Otherwise your existing gigabit switch with 1Gb uplink can make sense. The current information ear is and will continue to be in full swing while pulsed by networking high traffic and applications. Meanwhile, with productivity greatly improved by technologies like VLAN, Cloud Computing and IEEE 802.11ac, gigabit Ethernet switch can no longer bear the high pressure in enterprise-class data centers, SMBs and even homes. In this circumstance 10GbE network is required for meeting the demands. And as a core component, 10GbE switch is dispensable for 10G network upgrade. So here provides a guide for buying 10GbE switch for SMB and offers some cost-effective 10gbe switches for your selection. For the high expense out of advanced performance required by 10GbE network, the purchase market of 10GbE switch is generally not very optimistic for SMBs. Searching on many forums and communities for 10Gb switch, we can see Cisco switches are always the hot topic. However, one will hesitate to pick Cisco and some other brand-name 10GbE switches especially for SMB out of budget concerns. In this regard FS specially designed a series of 10Gb switches for SMBs under cost-effectiveness and equal performance concerns. By deploying such 10GbE switch to your SMB network, one can benefit from reduced response time, smooth operation in high traffic and improved work efficiency. Based on budget saving of SMBs, here are some considerations for choosing an affordable 10GbE switch. In the market the 1/10Gb switch is often equipped with 4 × SFP+ uplink ports for 10G uplink network, which is very suitable for small, medium and some start-up business. For the demand of remaining your gigabit for 1G devices, you should also consider about the gigabit ports with 12/24/32/48 ports for selection. Stackable 10GbE switch is very common in network upgrade for simplified management and link aggregation. 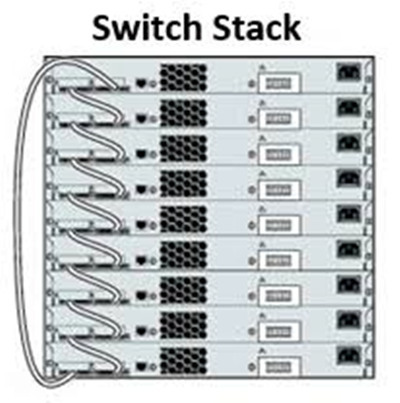 Taking FS S3800 Series managed stackable switches as example. With 4 × S3800-24T4S 10Gb switch stacked together to work as a whole system, operators no longer need to control each switch individually but managed it as a single switch with one console port. Moreover, it will become very easy to add and remove any switch from the stacking system. Figure 1: Using 4 × S3800-24T4S stackable 24 port switches for link aggregation in a data center. Unmanged 10GbE switch is a configuration fixed plug-and-play switch, which not supports any customized configuration. Managed 10Gb switch has partly managed smart switch and fully managed switch option. Generally for optimized performance of 10G network, managed switch is dispensable for SMB to ensure smooth operation in heavy workload. Also, it provides traffic control, customization and security monitoring. Getting rid of extra power cable for connecting devices with power outlet, PoE 10GbE switch provides placing flexibility to powered devices such as IP phones and wireless access points. For instance, FS S1600-48T4S 48 port PoE+ switch with 4 × 10G SFP+ ports can supply power to a series PDs with PoE budget up to 600W. However, if power supply is not a question, one can pick non-PoE for budget saving. After explaining the aforesaid factors for 10GbE switch selection, we’ll give you a clue for affordable options of 10Gb switch. For SMBs and home labs, the most cost-effective solution is to pick up gigabit switch with 10G uplink rather than 10G core switch. Here we recommend you such managed 10GbE switches, ranging from 1000Base-T copper switch or SFP switch with 24/48 ports and PoE availability. For SMB with very tight budget, one can go for S3700/S3800 Series. 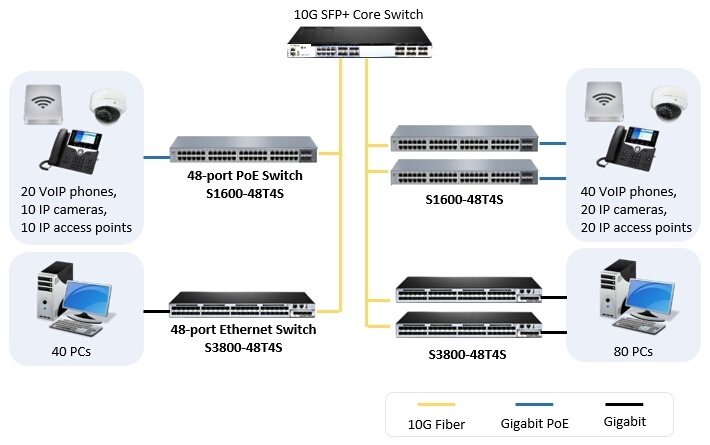 S1600-48T4S 10Gb switch is also a cost-saving way to go for PoE technology. It is noted that SFP switch often costs more than copper switch, but owns higher switch class and functionality. Say, S5800-48F4S 10GbE switch is a layer2/3 SFP switch, natural fit for applications of data centers as carrier access switch. It has low latency and advanced features such as MLAG nd SFLOW. 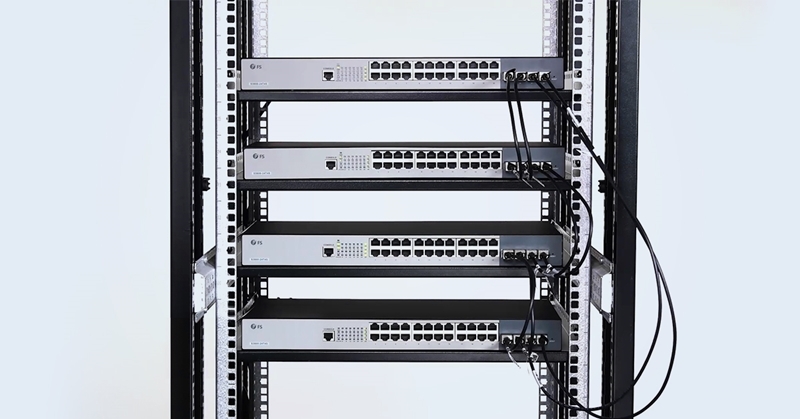 Figure 2: Deploying S3800-48T4S SFP switch and S1600-48T4S PoE switch as access switches in 10G network. For 10GbE switch option of small to medium business, budget is always a big concern. Based on this regard, one should consider buying gigabit Ethernet switch with 10G uplink. Further, taking a comprehensive consideration of number of port, managed ability, PoE and stackability will make the best decision of 10Gb switch.